I’ve received a number of emails from people who were intrigued by the analysis in the previous piece of the dwindling of research and development in rights technologies in the United States in recent years. Number of relevant papers published in IEEE and ACM journals and conference proceedings. Gross Expenditure on Research & Development (GERD*). The index takes the number of papers published during a given time period and divides it into GERD. In other words, it gives an indication of how much effort a country spends on rights technologies research (including DRM, watermarking, fingerprinting, rights expression languages, licensing automation, etc.) that’s proportional to overall R&D spending as opposed to population or even GDP. I examined IEEE and ACM search results from 2008 to date, the year from which the latest GERD figures are generally available. The chart below shows the results. 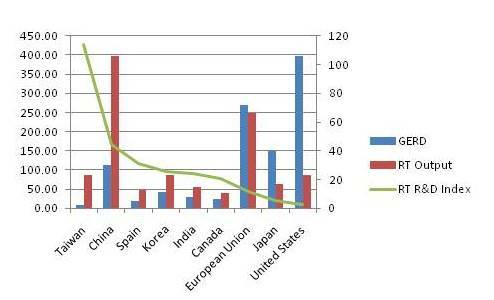 GERD (blue columns) is shown in US $Billions, with index on the left. RT Output (red columns) is shown as a proportion of the world’s rights technologies research output coming from that country, normalized to GERD for an “apples to apples” comparison. Finally, the green line is the Rights Technologies R&D Index, which is a ratio of research output to GERD. Rights Technologies R&D Index by Country. ©2010 GiantSteps Media Technology Strategies. By the way, the countries with the next tiers of activity behind these are mostly European: Greece, Slovakia, Germany, Italy, Netherlands, Morocco, Finland, Ireland, Singapore, and UK. Why is the US so far behind? What do you think? Here’s a poll. Feel free to add a comment if you have other ideas. *Not to be confused with Gastroesophageal Reflux Disease, which is what you find if you do a Google search on GERD. Following the Ultraviolet announcement maybe U.S. rights technology R&D has not dried up. Perhaps a lot of work is going on under confidentiality wraps whereby R&D ers are not allowed to speak about or publish their work. this would apply to single company and consortia R&D. Think of it this way, if you are running a major corporate you are sensitive to consumer market reactions to DRM so you’re not going to say anything about it for fear of adversely impacting your share price. Also if you are running a major corporate you are not going to tell competition what you are doing for fear of losing competitive advantage. Finally you are not going to bring anything to market until it really works with no adverse consumer experience. Given that Chinese and Taiwanese companies are generally not leaders in this space then it would be natural for their researchers to publish their papers to get attention. Also strangely the EU and perhaps US governments fund some R&D in China for political and economic reasons which the population at large are unaware of. So its less commercially sensitive R&D. Comparing no of papers with population would yield a very different picture. And then there’s the quality of R&D and what the papers represent. given the international OECD comparisons on no’s of graduates, PhD’s, patents, papers etc. surprise surprise we find the numbers of people and papers increasing to get a good ranking in the league tables. Actually I think the most important question is how one defines R&D. I thought carefully about this but did not explain my rationale very carefully because I didn’t want my written piece to go off into a lengthy sidetrack. My basic premise is that current rights technologies are lacking in various respects (we don’t have to recite them all here), so what we need is fundamental research to solve problems. Some people make the “DRM will never work, so why bother trying” argument. This is a total cop-out, given the huge number of technologies we take for granted today that were judged “impossible” until some people actually bothered to try to solve them. I have experience in academic research, so this is the yardstick I have chosen to use. Much of what goes on in corporate R&D labs, and consortia such as DECE, is meant to meet short-term industrial interests, so I would not classify it as actual research (yes, there are exceptions, e.g. Intertrust does bona fide research). One might as well count patents, which IMHO are a poor indicator of actual research output. So, I’m looking at fundamental research with potential long-term impact – the kind that is supposedly done in academic and industrial research labs that produce output such as conference papers and journal articles. Somewhat contrary to what you suggest, what’s most interesting to me about the country-by-country figures is that the vast majority of the research output comes from “device manufacturer” countries like Taiwan, China, and Korea, where as the countries with the major content-producing entities — the US, UK, France, Germany — are low on the list (Japan is some of each and thus is in the middle). This to me is completely consistent with the reality of who ends up paying for these technologies. In other words, I would bet that the research output in places like Taiwan and Korea is high because of a combination of grant money coming from the major device makers there (Acer, ASUS, HTC, Samsung, LG), researchers expecting that such companies will be interested in such research (e.g. offering them employment), or researchers expecting to build startups that will sell or license their technologies to those companies. Great work, Bill. In a case like this numbers are very persuasive — congratulations for changing the argument from theoretical to actual. I voted for “there’s no money in it” also. It all makes for an interesting juxtaposition. The industries most vocal about DRM claim to be losing millions, billions and gazillions, but because their balance sheets don’t reflect reduced losses as a separate positive income category, they have a hard time internally selling investments in DRM technology. Very much looking forward to your comments next week. not so sure about that……revenue assurance is a big are of activity these days across a range of industries. matching R&D with impact on revenue is a finely developed science these days which involves a range of disciplines including finance and marketing. I think if one looked at those Chinese and Taiwanese R&D papers we’d find quite a bit of literature reviews and reworking of US work. R&D papers aren’t absolute but peer reviewed. also one has to look at the institutions that those R&D papers come from. some are academically excellent – others less so. With respect, I disagree with your blanket assertion that “matching R&D with impact on revenue is a finely developed science these days ,” having been involved with the R&D Labs of a large silicon valley IT company and seen its lack of relationship with product development. It may be true in some places but not all. then all we can conclude is that my experience has been different from yours 🙂 including large silicon valley high tech firms, but I agree with you that it is true in some places but not all, as those working in R&D labs can attest to their painful experience of filling in endless funding requests and budgetary forms and having to justify projects to or with the finance and marketing teams (if they get exposed to it – maybe it occurs at a higher level). My experience shows product development being a multidisciplinary team activity which includes R&D and has checks and balances along the way to verify the commercial case. Keep in mind the DECE isn’t R&D’ing anything. That’s their member companies’ jobs.